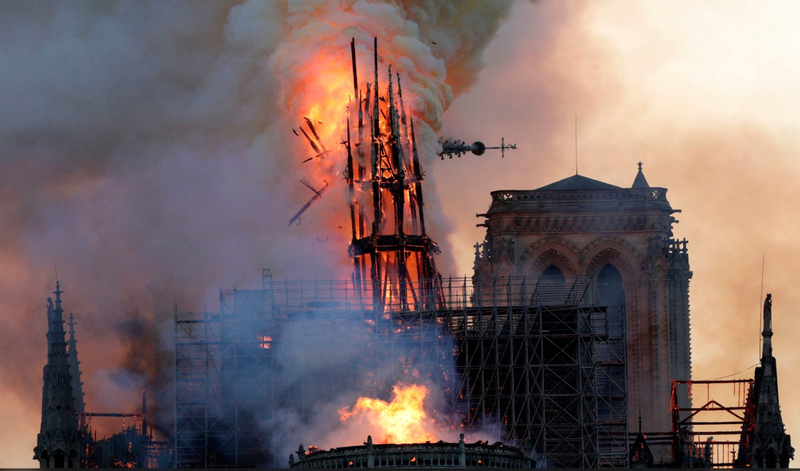 The fire that swept through Notre Dame Cathedral is, according to a reporter interviewed by NPR this afternoon, the heartbreaking culmination of years of neglect toward one of Europe's great architectural landmarks. The above picture, from Getty Images, is from The New York Times' coverage of the event. Jesus is the Rock on Whom the Church is built. And the Church isn't buildings, though buildings can be places where the Church meets for worship, prayer, praise, and the deputization of the Holy Spirit to spread the good news that all who repent and believe in Jesus as their God and Savior have life with God that never ends. The Church is God's people, the body of Christ, living stones built into the Cornerstone, Jesus, once rejected by the world, Who died for the sins of all humanity and rose to open the way to eternity with God for all who trust in Him.